If you awake with a stiff neck, headache or backache, you may be sleeping with your neck in the wrong position. 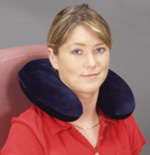 Our neck support pillow, back support pillow and Lumbar support cushion are designed to correctly align your neck with the rest of your body, helping to relieve any pressure and pain. 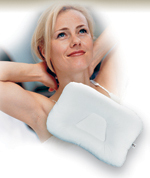 Our orthopedic pillows come in a variety of shapes and firmness, able to fit every need. The Tri-Core, fiber-filled pillow, is the highest quality cervical pillow now available and the Headache Ice Pillo which helps to relieve migraines has also been nationally recognized its quality and performance. If you prefer a foam back support cushion, then one of our contour pillows may be what you need. In addition to our line of neck pillows, we offer other unique products such as the Bed Wedge, Knee Elevator, Leg Spacer and Dutchman Rolls to make your night's sleep more comfortable. Many people also need extra support for their back during the day, while sitting in a chair at home, at their desk at work, or while riding in their car. The Sitback Rest, nationally recognized for its design and performance may work for you. These durable backrests come in several styles, colors and firmness levels to choose from. Let one of these attractive backrests make sitting more comfortable for you.